Mobile Harvest Ticket – When harvesting in several different areas that can be many miles apart, putting tickets on trailers involves a lot of driving and an inefficient use of time. Our Mobile Harvest Ticket feature not only eliminates the expense of driving many miles to different locations, it also can be sent directly to other locations via email, cloud storage, or text as soon as it is entered. 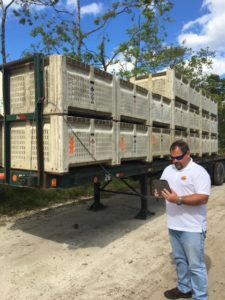 The packinghouse, processing facility, clerical staff, harvest company and management can have the information as soon as the trailer is picked up instead of waiting for the hand-written copy to be delivered to the office or facility. The ticket also automatically generates harvest yield and sales record. The accumulated ticket information during the season can be analyzed using the downloaded data file in Excel or Google sheets which can be sorted by date, grower, grove, block. The data is also available using our reporting system.